Vanessa Hudgens already started promoting her new film 'Second Act' and today(October 3rd) she posted her look from an appearance on instagram. 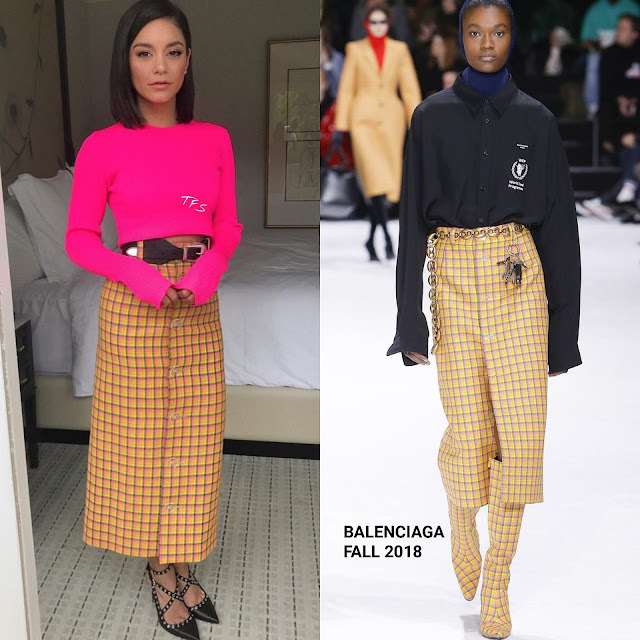 She posed for the gram wearing a BALENCIAGA FALL 2018 hot pink ling sleeve crop top and a yellow & pink plaid, center front split skirt. While I do wish the skirt was a bit more tailored & shorter, I like this ensemble in general. The hot pink top really gives it life. However I would swap out the BRIAN ATWOOD black strappy pumps for a basic pump or ankle strap sandal. Are you sold on Vanessa's instagram style?